A new logo and new look for Chip Carter.com! I’m so stoked, I love this new icon, designed by the awesome folks at The MindLabs! Also … my new book (yes, it’s small – but it IS a book, gosh-darn it!) comes out this month. 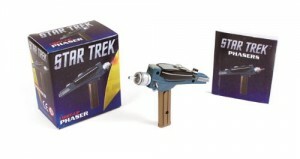 The Star Trek Light-up Phaser and mini-book is on Amazon and will be in stores soon! Off to Phoenix for a conference, so no time to discuss this week’s Justified, RuPaul OR the Real Housewives of BH reunion!